Congratulations, you’re expecting a baby! This is a wonderful and exciting time, with lots of changes on the way. 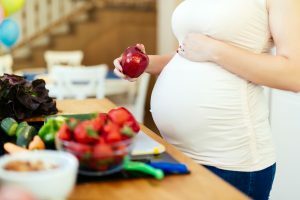 One of the things you will want to stay on top of is your diet, since your growing baby will take his or her (or their!) nutrition from what you put in your body. Following are some things you should be sure to get plenty of for the next several months. 1. Start your day off right with a cereal fortified with folate, also known as folic acid when it comes in supplement form. Folate is essential in the formation of your baby’s brain and central nervous system, and helps protect baby from neural tube defect, like spina bifida. 2. Yogurt is a great way to get a good shot of calcium first thing in the morning, and the live cultures can assist with easing the effects of morning sickness. Calcium helps baby’s bones grow, and helps your bones stay strong. It also helps your nerves and muscles function correctly. This portable breakfast or snack food is also a great source of protein, which every pregnant mom needs. 3. Eggs are another source of good quality protein, as well as more than 12 vitamins and minerals, and are relatively low in saturated fat. Eggs are quick and easy to prepare, and extremely versatile. Scramble some for breakfast, make some egg salad for lunch, or hard boil some to take on the go. Some eggs contain omega-3 fats, which are very important for both brain and vision development. Eggs with omega-3s usually say so on the label. Look for DHA-enriched eggs for the most beneficial form of omega-3s. 4. Another source of folate as well as vitamins C, E, and K are avocados. They are also high in fiber, potassium and copper. Potassium may help relieve leg cramps, a side effect common in pregnant women. This luscious fruit also offers lots of monounsaturated or “good” fat, which can help with appetite control. If you thought avocados were only good for guacamole, try spreading some on a piece of toasted sprouted grain bread in the morning for a different kind of breakfast treat. Add avocado to a lunch or dinner time salad full of healthy dark green leafy vegetables like kale and spinach, and your body (and baby) will also get a good dose of antioxidants and fiber, which will help with the constipation that sometimes accompanies pregnancy. 5. Salmon is another healthy food that is rich in essential omega-3 fatty acids which most people, including pregnant women, are not getting nearly enough of from their diet. If eggs aren’t your thing, eating salmon can give you the amount of these essential fatty acids necessary. Studies have shown that pregnant women who eat 2–3 meals of fatty fish per week achieve the recommended intake of omega-3 and increase their blood levels of EPA and DHA. 6. Lean meat is a great source of the protein pregnant women need to support a growing baby. Beef, pork, and chicken are excellent sources of high-quality protein. Beef and pork are also rich in iron, choline, and other B-vitamins, all of which pregnant women require in higher amounts. is important for delivering oxygen to all cells in the body. Pregnant women need more iron due to an increase in blood volume. This is particularly important during the third trimester. Add lean cuts of meat to a salad with dark green leafy veggies and ¼ avocado, and you have a complete meal.https://www.coobwomenshealth.com/7. Bananas also offer the potassium a pregnant woman needs, and are easily digestible. Add berries to your banana and get the benefit of their fiber, water, healthy carbs, vitamin C, healthy carbohydrates, and plant compounds. Berries have a relatively low glycemic index value, so they should not cause major spikes in blood sugar. Toss your fruit into a blender with some yogurt, and you have a great breakfast, lunch, or afternoon snack full of a lot of vitamins and nutrients your body needs during pregnancy. 8. Nuts and nut butters are good sources of heart-healthy, unsaturated fat to help build your baby’s growing brain, and are also packed with important minerals (copper, manganese, magnesium, selenium, zinc, potassium, and even calcium) and vitamin E. Nuts are very portable, so they make a good snack to grab when you’re on the go, and they pair well with just about any dish; toss a handful into your salads, pasta, meat dishes, and baked goods for some extra protein. 9. If you’re not a meat eater, beans make a good protein substitute, and are also a good source of fiber, which can help prevent or relieve the constipation and hemorrhoids that sometimes result from being pregnant. Beans also contain iron, calcium, folate, and zinc, all essential nutrients. 10. Sweet potatoes are a good way to get the vitamin A that is essential for growth and very important for healthy fetal development. Beta-carotene, a plant compound is converted into vitamin A in the body. Since pregnant women are generally advised to increase their vitamin A intake by 10–40%, these yummy tubers are a good way to do just that. They also contain fiber, which may help increase the sense of fullness, result in less calories consumed, reduce blood sugar spikes, and improve gastrointestinal health and movement. 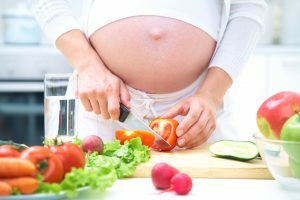 You may need to alter some of your dietary habits for the benefit of both you and your baby during your pregnancy, but it won’t be forever and the benefits of a healthy mom and healthy baby are well worth the sacrifice.